The West region is a sigh of contentment, an exhale, and a feeling of rejuvenation all in one. This region is as diverse as the rest of the state—so much to offer in a comparatively small space. The opportunities here are as wide and varied as the travelers that flock to the area. As you leave Mackinaw City and wind your way south, you’ll sample historic treats such as colorful Victorian cottages found in Bay View, the Earl Young Mushroom Houses, a historic tall ship to board, excursion boats and not historic but, yes even modern day casinos. 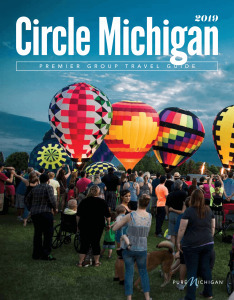 Wind up day one by overnighting at one of our wonderful Circle Michigan member hotels in the area. Cross in the Woods, Michigan’s best known and loved monument also believed to be the world’s largest crucifix and a National Shrine. Also over five hundred dolls dressed in the garb of religious orders. Castle Farms, our own castle in Michigan, with unique historic architecture and old-world charm; dine like royalty as your culinary delight today. 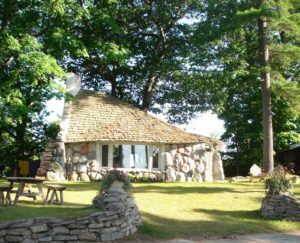 Earl Young Houses in Charlevoix, quaint homes resembling mushrooms (stepon tour available). Keweenaw Excursions, an historic journey on Lake Michigan, with breathtaking scenery and magnificent sunsets..
Odawa Casino Resort, enjoy some world-class gaming and entertainment at the number-one casino in Michigan. The Music House, a historic and extensive collection of rare instruments. Relax as you listen to rare automated musical instruments. Enjoy Cherry treats of the area. Guided tours up to Old Mission Lighthouse and Winery Tours available. Sleeping Bear Dunes National Lakeshore, with bluffs about four hundred feet above Lake Michigan. Pierce Stocking Scenic Drive, a self guided auto tour, is certainly a must-do activity when visiting Sleeping Bear Dunes National Lakeshore. 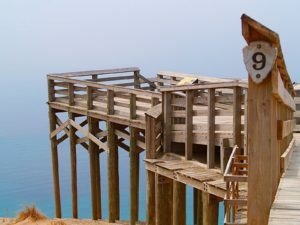 Continue south along the western shoreline of Lake Michigan, several historic Lighthouses catch our eye as well as a glimpse of the old coal-fired, steam powered passenger ship SS Badger, a relaxing option for crossing Lake Michigan into Wisconsin. Further down the road, a visit to the beautiful historic homes of area Lumber barons. 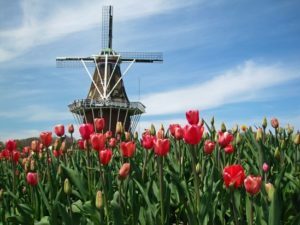 Yes, West Michigan has the Tulip Time Festival in Holland Michigan, voted a “best small town festival” by Readers Digest, and takes place each year in early May, over 80 years! Now that is history. Several culinary treat stops are also included today, including ice cream, blanket, (a Dutch treat) and a treat made with flour ground from the 250-year-old windmill. A special culinary treat is an educational chat on cooking with herbs. This evening we again relax at one of the Circle Michigan member hotels of the area in Ludington or Manistee Michigan. Historic Lake Michigan Car Ferry (including buses)/SS Badger, the last coal-fired, steam powered passenger ship on the Great Lakes. Relax on this four hour cruise between Ludington Michigan, and Manitowoc Wisconsin. Country Dairy, a dairy tour where over one thousand cows are milked. A farm store and adjacent Moo School also located at the farm. Hackley & Hume Historic sites of Muskegon, Lumber Baron Homes preserved for the natural and cultural history of the area including detailed and beautifully decorative woodcarving. Nelis Dutch Village, Klompen Dancing, street scrubbing, cheese tasting, Wooden Shoe making, a costume museum, are just a few things to experience at the village. Windmill Island Gardens, a thirty five acre manicured park featuring an authentic Dutch Windmill still capable of producing stone-ground flour. Also an antique Dutch Carousel and a street organ from Amsterdam. Frederik Meijer Gardens, a 125 acre Sculpture Park and tropical conservatory. Included is the Midwest’s most comprehensive outdoor sculpture collection featuring the three-story-tall Leonardo daVinci horse. A special historic visit to a presidential museum representing the thirty-eighth president of the United States, Gerald R. Ford, including his burial plot just outside the museum. As the sun sets and you depart the Western shores of Lake Michigan, you will depart with fond memories of your West Michigan Culinary delights and Historic Treats visit.